Close-up of Burda’s version of the skirt. 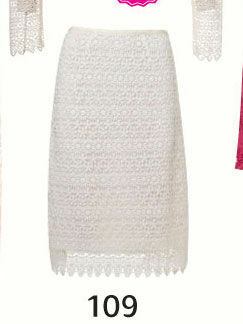 My version of the lacey white skirt! Love the length and they way it hangs. Side seam with invisible zipper. Close-up of my cotton eyelet “lace like” fabric. The inside. You can see my ribbon waist stay on the left, and the seam binding. 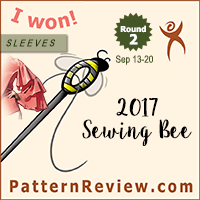 Pattern Description: A-line skirt with waist darts for fitting and ribbon waistband. Pattern Sizing: Burda sizes 38-44. I cut a size 40 on the waist and graded out to a 44 on the hips. Were the instructions easy to follow? Yes, I thought the instructions were decent for Burda. I changed the construction a bit though, because I didn’t want the seam allowances to be visible through the outer fabric. Did it look like the photo/drawing when you were done with it? Yes! I was really inspired by the lace skirt in the Burda magazine, and I wanted to make one as close to the original as possible. However, I thought that a lace skirt might be a bit impractical, so I used embroidered cotton eyelet to get a similar effect with less likelihood of snagging. What did you particularly like/dislike about this pattern? Likes: I love that this is drafted for use with a lace that has a scalloped edge – it would also be great for a boarder print. I also love how simple the skirt is – just four darts and the side seams, yet it is enough to create a nice fit. I am also a fan of the A-line style – I think it is rather slimming. Dislikes: I think this skirt might be just a tiny bit too high waisted, which I changed a bit with my construction decisions. Fabric used: Embroidered cotton eyelet for the outside “lace” portion of the skirt, and acetate lining (from the recent $1.99 Vera Wang sale at Fabric Mart). I also used an invisible zipper and a ribbon for the waistband. Pattern alterations or design changes you made: As far as alterations go, I added an extra 1/2″ of width to the skirt front piece below the dart so that it would lie more smoothly over my thighs (ah, skater thighs…). I also changed the construction a bit. First, I treated the outside and lining fabric as one piece rather than separately so that the seams would all be on the inside of the skirt and not visible through the eyelet. Also, I changed the ribbon waistband into more of a waist stay. Since the skirt is rather high waisted to begin with, I didn’t want to add to the height by adding the ribbon waistband, so instead I flipped it to the inside and used it as a stabilizing waist stay. Otherwise I made the skirt as instructed. Would you sew this again? Would you recommend it to others? Yes! I really like the way this skirt turned out, and this might be heading to a TNT pattern status. I would love to find a great boarder print to use with this pattern in the future. Or, of course, for more lace skirts. 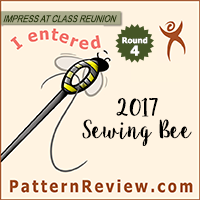 I would highly recommend this to others – the fit is great, it is easy to make, and the style is quite flattering. Very easy to make a great on-trend skirt! Conclusion: Love this pattern! A lovely simple pattern that really lets the fabric be the star. I expect I will be wearing my skirt a lot this spring, and I also think I will be using this pattern again in the future. What I Have Been Up To And New Fabric! Oh, cute! Love the fabric, too. I agree that it's probably far more durable than lace. Very pretty! I like the white on white. Beautiful skirt! Such a classy and classic look for Spring.